Atelier Contemporain is the first European editor of Digigraphie® (Trademark of artistic digital print in series registered by Epson). „Art in all its form is a luxury product ,(elitiste,) inaccessible to the majority of people. Besies, also the history tells us that it is impossible for an artist to live during his life time. (…)In many cases , it wasn't the lack of creativity that led to failure but the lack of entrepreneurial spirit.“, states Lisa Vidal, painter and Frank Tempier, entrepreneur. 8 people give their best everyday to ensure your satisfaction. Their work is divided into production, logistics,business developement, art direction and executive management. Make contemporary art accessible to as many people as possible. At first, accessibility by means of affordable prices. By realising Digigraphies in limited-editions which ar numbered and signed, the costs of creation are divided. Discovering and promoting talented artists. Contemporary artists and especially the new generation of digital artists are unknown to the general public. Therefore, Atelier Contemporain gives them the opportu­nity to establish their business and to live out their creativity and genius. Galleries´doors are uninviting. So we need to bring artworks to general public places (boutiques and con­cept stores oft he home´s world). Setting value by creating a scarcity value. By means of limited-editions which are numbered and signed, contracts exclusively signed by th artist but also by means of particular quality standards of fabri­cation and resitence of the artworks ordenary persons concerning contemporary art or collecters like you and me, we find rarity, talent and creativity in Digigra­phie®. 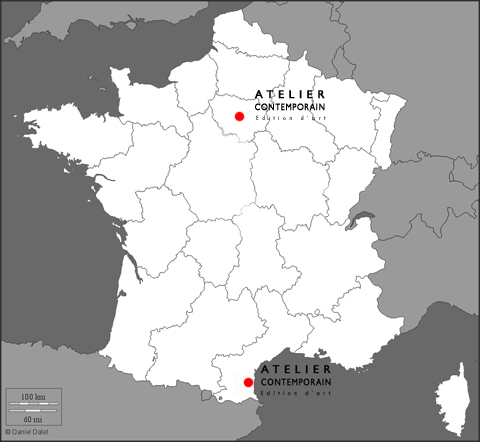 Our artisan atelier is located in the south of France in the outskirts of Perpignan in the district of famous muscatel wine of Rivesaltes . Near the highway A9 our logistic situation ist he best here at the southern end of France. We guarantee shipping within two days every­where in France before 9:00.